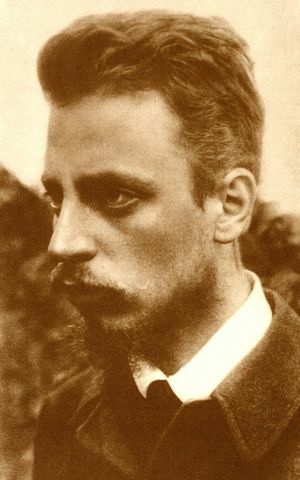 “When a truly great and unique spirit speaks, the lesser ones must be silent,” Franz Xaver Kappus wrote about Rainer Marie Rilke. Over a period of about six years Kappus and Rilke exchanged letters. Kappus began the correspondence seeking Rilke’s judgment and critique of his poetry. Rilke offered wisdom rather than answers, a way rather than a destination. Rilke’s letters were published posthumously as Letters to a Young Poet. Despite the title, Rilke’s words are not limited to the young or would-be poets. Rilke’s words touch the human soul and invite change. You ask whether your poems are good. You send them to publishers; you compare them with other poems; you are disturbed when certain publishers reject your attempts. Well now, since you have given me permission to advise you, I suggest that you give all that up. You’re looking outward and, above all else, that you must not do now. No one can advise and help you, no one. There is only one way: Go within…. Therefore, my dear friend, I know of no other advice than this: Go within and scale the depths of your being from which your very life springs forth. At its source you will find the answer to the question…. All things consist of carrying to term and then giving birth. To allow the completion of every impression, every germ of a feeling deep within, in darkness, beyond words, in the realm of instinct unattainable by logic, to await humbly and patiently the hour of the descent of a new clarity: that alone is to live one’s art, in the realm of understanding as in that of creativity. I would like to beg of you, dear friend, as well as I can, to have patience with everything that remains unsolved in your heart. Try to love the questions themselves, like locked rooms and like books written in a foreign language. Do not now look for the answers. They cannot now be given to you because you could not live them. It is a question of experiencing everything. At present you need to live the question. Perhaps you will gradually, without even noticing it, find yourself experiencing the answer, some distant day. Perhaps you are indeed carrying within yourself the potential to visualize, to design, and to create for yourself an utterly satisfying, joyful, and pure lifestyle. Discipline yourself to attain it, but accept that which comes to you with deep trust, and as long as it comes from your own will, from your own inner need, accept it, and do not hate anything. Think, dear friend, reflect on the world that you carry within yourself. And name this thinking what you wish. It might be recollections of your childhood or yearning for your own future. Just be sure that you observe carefully what wells up within you and place that above everything that you notice around you. Your innermost happening is worth all your love. You must somehow work on that. People have, with the help of so many conventions, resolved everything the easy way, on the easiest side of easy. But it is clear that we must embrace struggle. Every living thing conforms to it. Everything in nature grows and struggles in its own way, establishing its own identity, insisting on it at all costs, against all resistance. We can be sure of very little, but the need to court struggle is a surety that will not leave us. It is always my wish that you might find enough patience within yourself to endure, and enough innocence to have faith. It is my wish that you might gain more and more trust in whatever is difficult for you…. Allow life to happen to you. Believe me, life is right in all cases. Your doubt can become a good attribute if you discipline it. It must become a knowing; it must become the critic. Ask it, as often as it wishes to spoil something, why something is ugly. Demand proof of it, test it, and you will find it perhaps perplexed and confused, perhaps also in protest. Don’t give in; demand arguments. Act with alertness and responsibility, each and every time, and the day will come when doubt will change from the destroyer to become one of your best fellow-workers, perhaps the wisest of all that have a part in building your life. These and many other words from Rilke’s Letters challenge and resonate within me. They are words of spiritual guidance, nurture, and encouragement. In many ways it seems as if he is writing to me. Perhaps it feels that way for you too. What does he teach you? What have you learned? I suspect he is also writing to himself. Thanks, Father. I read Rilke (and particularly the Letters to a Young Poet) in college. I hadn’t thought of them much since then. Rainer Maria Rilke speaks to me, too. Above all, I hear “be patient”. Trust the process; trust the difficulties. Avoid seeking easy (or polarized) answers. Thank you, Mike, for the poignant reminders of Rilke! The phrases, “At present you need to live the question”, and the “need to court struggle” speak to me. Thank you for choosing the best of Rilke’s book. I’ve never gotten around to reading it. That has always been part of my own work – to live in the tension and not move to “the answer” too quickly. Rilke’s Letters is a great book and worth reading again and again.